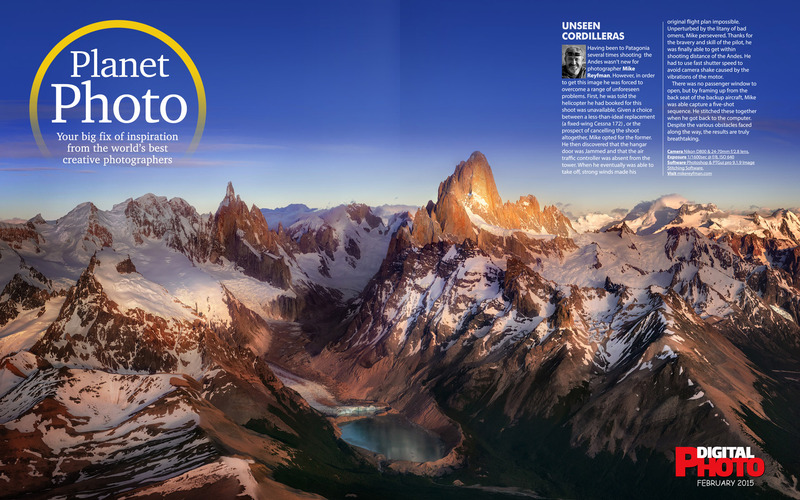 Having been to Patagonia several times shooting the Andes wasn’t new for photographer Mike Reyfman. However, in order to get this image he was forced to overcome a range of unforeseen problems. First, he was told the helicopter he had booked for this shoot was unavailable. Given a choice between a less-than-ideal replacement (a fixed-wing Cessna 172) , or the prospect of cancelling the shoot altogether, Mike opted for the former. He then discovered that the hangar door was Jammed and that the air traffic controller was absent from the tower. When he eventually was able to take off, strong winds made his original flight plan impossible. Unperturbed by the litany of bad omens, Mike persevered. Thanks for the bravery and skill of the pilot, he was finally able to get within shooting distance of the Andes. He had to use fast shutter speed to avoid camera shake caused by the vibrations of the motor. There was no passenger window to open, but by framing up from the back seat of the backup aircraft, Mike was able capture a five-shot sequence. He stitched these together when he got back to the computer. Despite the various obstacles faced along the way, the results are truly breathtaking. Camera Nikon D800 & 24-70mm f/2.8 lens. Software Photoshop & PTGui pro 9.1.9 Image Stitching Software.